Smith Chu Flagship Store is founded in the year 2010. This is a professional firm which sales brand Smith Chu scissors and barber supplies. Smith Chu has professional team with more than 100 employees, strict management and excellent equipment which allows to distribute its production all over the world. These Smith Chu HM100 hair cutting and thinning shears are made of Japanese 440C stainless steel with hardness 62 HRC which is known as extremely durable and long-lasting material. Hair cutting shears have convex hollow ground blades, but hair thinning scissors have one blade with convex edge, but other blade with 30 micro-teeth which ensure 15-25% thinning rate. Convex edge blades are razor-sharp, ensuring fast, smooth and precise hair cut. Both of these Smith Chu shears are 6.0 inches long. Another feature of these hair scissors is adjustment knob which is hidden with light blue crystal and allows to set a desired cutting tension. They also have non removable finger rest which helps to relieve the stress from hands and shoulders, preventing injuries and occupational diseases. Unfortunately they do not have finger inserts for finger rings which usually help to adjust the appropriate size and thus comfort. These Smith Chu shears have asymmetric handle which improves comfort and ergonomics of work, avoiding different traumas. Their handle also has cushioned stopper / silencer which provides silent, balanced and controlled hair cutting. This Smith Chu HM100 Kit comes in synthetic leather case and includes cutting shears, thinning scissors, sheepskin rub, comb, hair razor and regulator. As these hair shears are made of stainless steel, they are silver color with slight sheen. Their tension adjustment screw is hidden with light blue crystal which gives them elegance and daintiness. They have asymmetric handle with notched finger rings and curved shin. This Smith Chu set includes both hair cutting shears and hair thinning scissors, so you can cut and thin the hair, obtaining this kit. As this set includes the most essential tools for hairdressing and its price is quite affordable, it is suitable both for professionals and students. These Smith Chu cutting and thinning shears from HM100 kit are made of Japanese 440C stainless steel with hardness 62HRC. Both of hair cutting scissors blades are convex hollow ground blades, but blades of hair thinning shears are different – one blade is convex edge blade, but other blade is micro-teeth blade which has 30 teeth, ensuring 15-25% thinning rate. Both of these Smith Chu scissors are 6.0 inches long. Considering that they are made of stainless steel, they are silver color with nice sheen. These shears have hidden tension adjustment screw which is covered by light blue crystal. They also have asymmetric handle with curved shin and notched finger rings. Both of these Smith Chu hair shears have cushioned stopper / silencer and finger rest, but it is not removable. They also have non removable finger inserts. 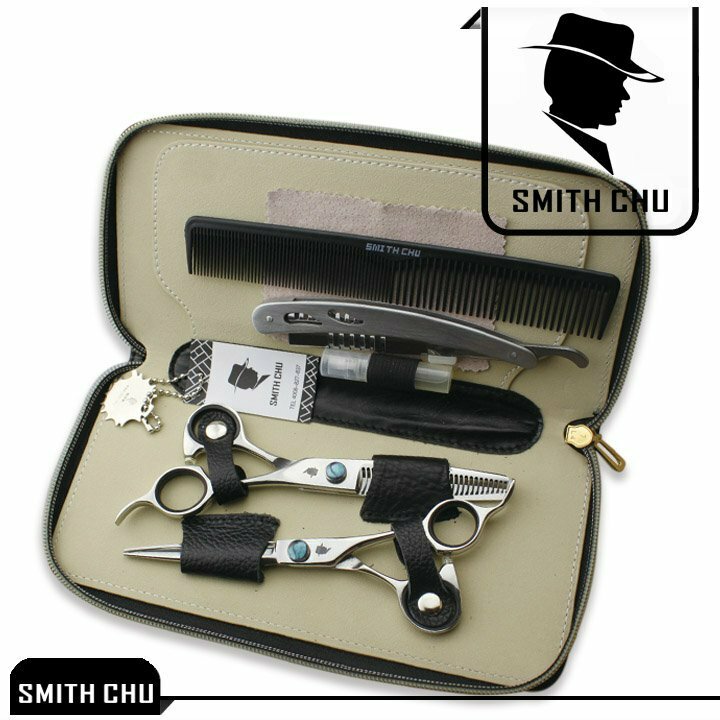 This Smith Chu HM100 kit includes one piece of hair cutting shears, one piece of hair thinning scissors, one piece of sheepskin rub, one piece of comb, one piece of hair razor, one piece of regulator, as well as synthetic leather storage case. This Smith Chu kit can be used both by professional hairdressers and hairdressing students.